The Spanish-Norman Horse Registry sponsors an annual high point award. Competition in all disciplines, presentations at horse shows and fairs, as well as participation in exhibitions, medieval games, parades, clinics, or any other equine related event qualifies! 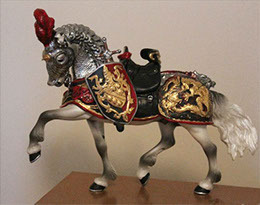 Previous year winners have received a collector’s, limited edition, Breyer horse model in porcelain, of ‘Breed Ambassador’ Romantico H.H.F., in armor, mounted on a wooden base with an engraved brass plaque. 2001 – Guerrero (Sir Norman of Tiverton), gelding, owned by Joanne Fiola – Rhode Island.